If Iron Man was the test flight (one that went very well), Iron Man 2 is the landing, which didn’t go quite as smoothly. This was only the 3rd MU movie, but already the entire project was taking shape, characters coming into play to set the stage for future films, stories and sequences forming to get us ready for what would be heading our way. 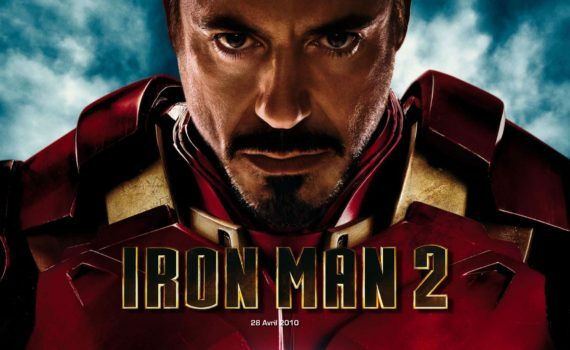 Knowing that, a few mistakes could be expected, and Iron Man 2 is far from perfect, which isn’t a shocker. It does too much, trying to stuff an entire franchise into two hours, and suffers because of it, but we also can’t be too hard on it; I think everyone was still getting settled in, and also trying to top the introduction, which had come out two years prior. It’s a small step back, but I can take it easy on the fledgling franchise, knowing what would eventually come once they worked out the kinks. Now that Tony is publicly Iron Man, the sky’s the limit to the amount of help he can be to the planet, and the size his head might grow in the process. There to keep him as grounded as possible are Pepper, with a relationship that’s getting more & more complicated, Justin Hammer, a competitor who has some sinister ideas, and crazed Russian Ivan Vanko, who has developed an arc reactor for himself to power his own mighty suit. Iron Man will have to team up with War Machine to stop this new threat, while many players take the stage to try to wrest the spotlight from Tony and his exploits. In the wings is S.H.I.E.L.D., an organization that is developing its own plan to protect Earth, led by Nick Fury and using Natasha Romanoff to infiltrate Stark Industries. Iron Man usually works alone, but he might need help this time, and he might not escape unscathed. I loved when Cheadle strolled in and Downey Jr. made a quip about not expecting to see him, Cheadle replying that they should just drop the subject. So we have a new War Machine, fine, he’s a cool character and Cheadle is a solid choice, I’ll take the advice and simply move on. Tony and Pepper are still the same, which only bothers me because I think Paltrow is horrible in her role. So is Favreau in his, Scarlett Johansson is introduced as Black Widow but comes across poorly, and Mickey Rourke is a ludicrous villain; thankfully Sam Rockwell stepped up and won me over with his character. So the casting is hit or miss, and so is the story, a bit chaotic and overly-ambitious. The action is still cool though, especially when Tony & Rhodey team up, so there are elements that work, I just think the sequel didn’t quite hold up to the original, or perhaps the team was doing too much, failed to hone in, and left some points on the board. Still, another piece of the MU puzzle, another awesome action flick, and another reason to be glad that this franchise exists.